It’s so good to see you here this morning Prudy! Isn’t funny how the cooler weather brings us to the point where we are craving stews, soups and slow cooked meals? Hope you get a pot of this simmering on your stove this weekend. It was a nice change serving with polenta rather than spaghetti. :) Made my day to see your comment! Wow, that bolognese is a labor of love that is well worth the effort. I love a good bolognese and must try this recipe. I love the long slow cooking which really will develop the flavor. Great over polenta. A wonderful and delicious meal. I saved your recipe to try I haven’t had a good bolognese in ages. What a great recipe and it looks so delicious. I love checking out other people’s bolognese recipes! This one sounds very interesting with the addition of milk, and the 6-hour cooking time. I imagine the beef must lose it’s graininess and become lovely and creamy with both those factors. Man, I’m suddenly starving and it’s 6.30am here! Agree, nothing better than a day off mid-week to do a little simmering. I’m in fact doing that myself today. It’s Spring here, but absolutely freezing. I have black beans soaking for chili con carne, but have bookmarked your recipe. I’d also like to have a crack at your polenta as that’s something I’ve never been able to get right! This looks absolutely divine! Now if I only had six hours to make the sauce… This is something I would love to make on a lazy cold weekend, though! Six hours of time at home usually only comes on the weekends for me, but then I’m so busy I don’t even think of putting something on the stove until the evening. It took having a day off during the week to throw me off my routine and consider something different, which was nice. Really is a lovely bolognese Kathryn. Thank you! I’m madly in love with your recipe. I love the challenge of doing a polenta but this is beyond anything I’ve thought of. Brilliant share. Exciting food art. How I love slow cooked meals, the house always smells so good and a wonderful mood overcomes everything. Polenta is one of my favorites and I just know I would love this Bolognese. Hi Cheri! Isn’t that the truth. I love the mood that something like this creates. It’s even a bit suspenseful…”when’s it going to be served?” It’s a lovely, satisfying dish. That sounds amazing. Six hours! And I love the idea of the nutmeg. I bet that smelled as heavenly as it tasted. Loved the flavor the nutmeg gave this bolognese. In my search for recipes I found some with cinnamon added as well. I decided to hold off on it and I actually added a little more nutmeg than most recipes call for. Thanks Johnny! I tend to hold off on cinnamon as well. Unless you can get cassia bark to cook with (as it doesn’t splinter like quills). Otherwise, most ground cinnamon is rough! I love this dish! I don’t think John would ever leave the table if I sat this in front of him. I passed on a bolognese ragu on vacation In Texas last week and now yours is here to make me droll and regret that decision! Love the nutmeg in the sauce and serving it on creamy polenta! I get it…sometimes I wouldn’t want a heavy bolognese sauce either. It takes cooler temperatures and of course and overcast sky helps to dish up a bowl of it. :) Vacation in Texas? How fun!! I love this recipe! I, too, was recently ‘going through’ various recipes for Bolognese sauce – I think you’ve come up with an excellent recipe. You know, a few days ago someone told me they can’t stand polenta. I told them that, if they didn’t like it, it is only because they haven’t had it properly made!! Apparently it’s not a genuine Bolognese ragu unless it has milk. The sauce sounds deliciously rich, I bet it was lip smackingly good on the polenta, I’m a big fan too. Oh lucky you! Serve it on polenta Nicole, and add a little pesto on top, it’s fabulous. Wish I would’ve had leftovers to freeze. Next time I’ll double the recipe because if you’re going to spend that much time cooking something you might as well make enough for a few meals. It probably freezes well too, right? Beautiful! I more often use polenta/grits than Americans use potatoes. There’s just something about cornmeal. Your Bolognese looks incredible!!! It’s true, there is just somethiing about polenta/grits. I love the creaminess and the texture. And it’s wonderful how you can go sweet or savory with them too. Thank you Mimi! You posted the polenta Seana!! I didn’t know the part about adding butter. That sounds like a delicious touch I’ll try. And your sauce sounds so rich and deeply flavored. I’d love to try this one (since I have an unfinished box of polenta in the cupboard calling my name). thanks!! It does sound like one of those recipes that would become a family favorite– I’d love to try it Seana! This sounds amazing! I bet it was so good:) real comfort food! No this is the ultimate comfort food. It looks so beautiful and perfect for a rainy, colder week. I love that you mixed polenta with Bolognese. It’s a dish that definitely needs meat and i love that it’s in the sauce rather than the main heft. Just wonderful. This is a keeper. Again, you eat just like I do. I always think that when I visit you here. The meals are simple to prepare, but use fresh ingredients, both seasonal and pantry staples and can be done either quickly or slowly depending on the amount of time you have, but it will always be delicious. 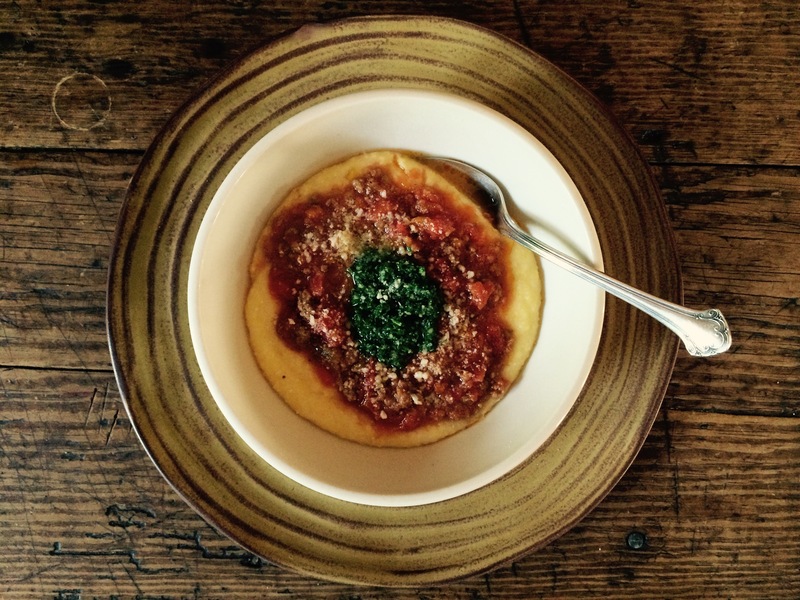 You are currently reading creamy polenta with slow cooked bolognese at COTTAGE GROVE HOUSE.